Tackling the trails while riding at night can be tough. You are going to find it quite hard even in twilight to negotiate your way through tracks and trails while riding a bike. Apart from falling over while riding your bike without lights, the absence of light can prevent cyclists from being able to see you when you are on the highway, which could result in accidents and you certainly do not want to be that victim. But it is not just about knowing that you need illumination while you ride, it’s about getting the best bike lights that will serve you just right. Below are some of the best mountain bike lights for night riding as well as a few of the features which in every sense makes for an entertaining guide to upgrading your bike with some newer set of lights. 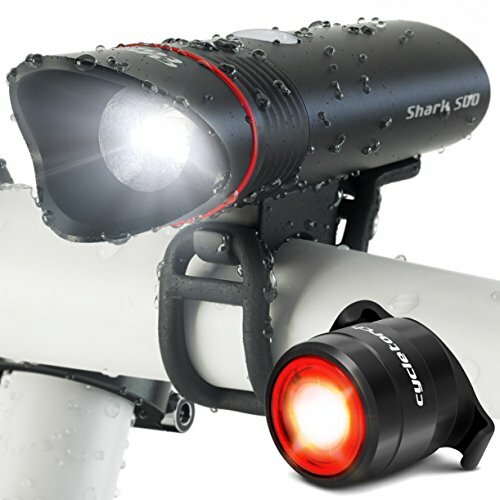 Shark 500 is your best bet if you are looking for a bike light which can provide you with very excellent illumination. This bike will make you visible from a very long distance away so you can be at rest about being seen by cyclists. 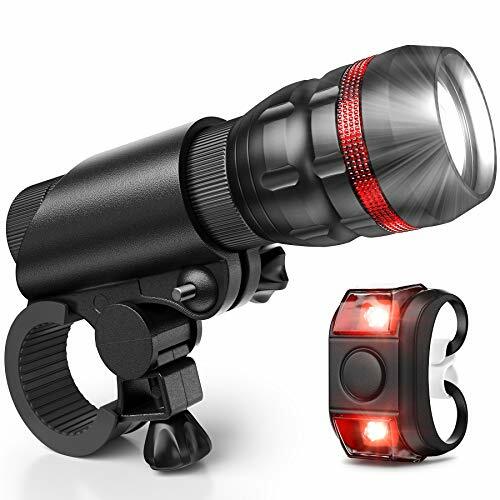 Whether you are road biking, mountain biking, city commuting or you want to use this bike light on your kid’s bike or even as a regular flashlight, you can be sure that this will serve you well. This bike light is designed with three rubber bands of different sizes to enable to cover just about any bicycle model. It is designed to be compatible with any bicycle handle not excluding those very thick Aero bars. It also includes a unique flay beam shape to prevent it from blinding motorists coming towards you Shark 500 also comes with a USB port to enable you to recharge your light. It even includes a USB cord which you can use for this purpose. This bicycle light also comes with a smart charging technology and can run for up to two hours. It also comes with a LED taillight bonus. You can very easily attach this light in a few seconds and you do not need any tools to do this. It is also as easily detachable as it is install-able so you can take it out when you want and replace when you want. What’s more? Shark 500 is also water resistant and so even if it is raining, you can be sure that you are covered, the light will not fail you in the middle of your ride. Plus it is very light and will not put undue weight on you or your bike. No matter the kind of bike you ride, Shark 500 has you covered entirely. Here is another affordable mountain bike light you can purchase to get the illumination you need while you ride at night. Just like the two above, this bike light will provide you with a perfect and clear vision while you ride at night. With this light which is also very long lasting, you can be sure of up to eight hours of performance after it has been charged. Vision 2 also comes with a USB charging port which you can as well plug into your computer, your power bank or a wall charger. It is also designed with waterproof materials to save your light from the rain as well as prevent it from failing you while you ride. In addition, it is built with aluminum and so is a very durable light which you can be sure will stay with you for a long time as it can resist harsh conditions. You can also install this on your bike very easily and in just a few seconds as well as take it out when you want and very easily so. You also do not need any tools to have this light installed on your lightweight mountain bike. It’s easy and uncomplicated. It additionally arrives with a rechargeable battery so you do not need to worry about getting the battery changed so soon. Whether you are on the road or the mountain or anywhere else, whether it is your hybrid bike or a mountain bike you want to use this on, the one ensures you have peace of mind. You can be assured that you will be equipped with excellent illumination and all the other road users will be sufficiently aware of you. Besides, this bike light is a very lightweight thing you can put on your bike without having to put up with any excess weight. The rechargeable headlight is fully waterproof to ensure you smoothly go through your trails without straining much to see in the dark. It is quite a powerful light with a LED-based build for the best hours of your biking. It will last you more than 5 hours while it is fully charged which makes it the best choice for adding lighting to your bike. It also fits with all kinds of handlebars making installation a breeze and has more features than any of its other similar competitors. Even in the daytime, the light has an extra strobe to make a clear path ahead for you as well as external batteries to far outshine your competition. It’s an ideal choice for camping, hiking and comes integrated with helmet accessories for that added protection while taking part in this activity. Fitting the lights on in easy and does not take much time and while you are out there and it gets dark, reaching for the switch is actually easy. The battery that comes with this light is very powerful and provides you with a long utility during which you will have gone through every trail in your neighborhood. The strength of this light means that it will not let you down by dimming while you are in the middle of a trail as being stranded in the dark tends to bring with it a whole hoard of chance encounters. 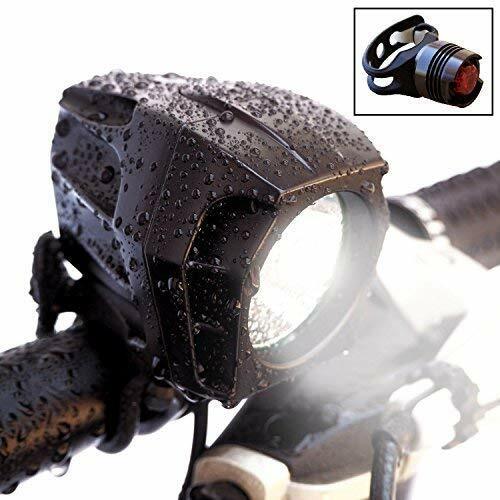 This mountain bike light is made of military-grade aluminum alloy and is designed waterproof to protect it from rainy weathers as well as prevent it from falling while you ride. It appears with a USB charging port which you can easily plug into your computer, power bank or any wall charger to power, so you do not need to go worrying about replacing the batteries. When it is fully charged, it can work continuously for up to five hours so you can rely on it. This bike light also comes with a smart temperature control system which enables it to cool down automatically when it gets to 145ºF. This helps to keep the battery protected. In addition, this light can be rotated in all directions so you can make it face just anywhere you want. This bike light comfortably fits smoothly on any bike set and is very easy to secure your bike. You can also just quickly take out the light when you want, maybe if you’re going to lock the bike outside and you do not want your light to get stolen. You do not even need any tools. This light is bright enough to make sure that all the cars coming towards you can see you particularly when you have to cross intersections. There is also a rear light included which comes with three settings; constant on, quick flash and slow flash. The three different settings will work just exactly as their names imply depending on whether you want to keep the light constantly on, if you wish to make a quick flash or if you wish to make a slow flash. In all, this bike light will help you to have a better and safer ride as it increases your visibility and also helps you to be aware of other road users. 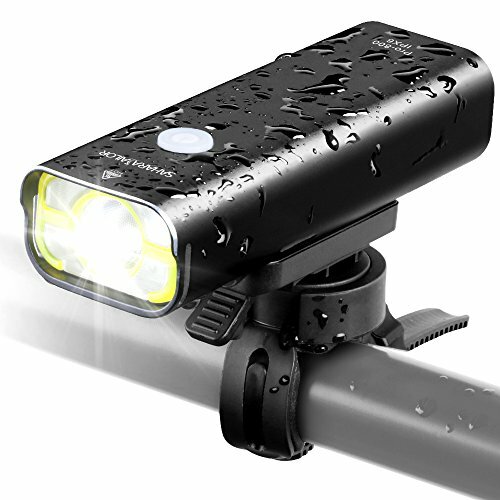 The DIVINE LED flashlight is the best useful addition you’d wish to have on your mountain bike as it comes with a full suite of features that makes it the brightest bike light. Up to standard, you will feel pleasure installing it as it is both durable, reliable and effective on the road. Even without tools, setting it up is easy and takes very little time so you have a breeze getting to your usual routines with a fully equipped and well-conditioned bike. By the statistics, more than 70% of fatal riding incidences happen in the night owing to a lack of clear vision and the conditions of the neighborhoods one found themselves riding through without a light. As such, all bikes should have quality lighting and with materials that are of military grade, your bike light is handcrafted with water-proof materials so as not to let you down as you are on the road. To ensure the best quality, all of the lights are checked individually and have been taken through a refined process which then assures you of excellent condition. 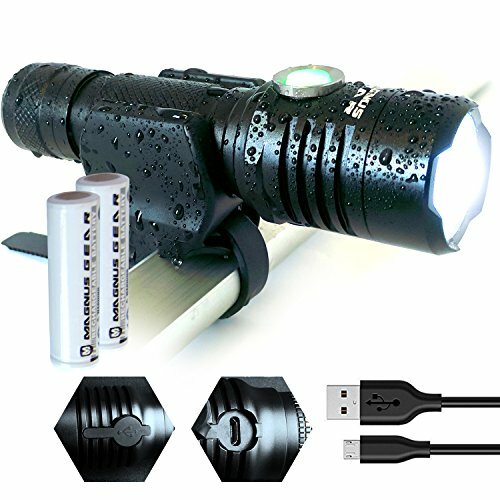 You can rest assured that the flashlight is durable and capable of lasting you for very long. Biking through any trail is rendered easy when you know that in case the night settles earlier than you complete your training, nothing will be of worry to you. The biking light has also been taken through rigorous standard checks to give you more lifetime and usage of your bike which translates into more hours of physical training and a better standard of the sport. The light is powerfully bright as it comes with high power LEDs and even emits ultra-bright light to illuminate your way up to 500 feet away. It works to ensure that you are both safe and secure during your rides or commutes by an easy comfortable fit and a fast installation so that the way ahead of you is lighted and brightened up to match your soaring spirits. It is also easy to use with a 3 switch mode which is a single button that takes you through multiple settings. Additionally, this button doubles up as a battery indicator for providing you with warnings wherever your light is starting to get dim. More extended running time from the batteries gives you more hours of light for riding far into the night. Also, the light installs in seconds and fits with all handlebars owing to easy rubber mounts. Once you have set your hands on the lights, moving ahead will not be a cause for concern as you will easily move through strange locales without having seen everything as you went through. These lights are extremely powerful and bright with powerful batteries for an extended lifetime and better hiking on your favorite spots. One of the best bike lights with the latest technology in the market. It is extremely bright with an output of 1200 lumen. The light set includes; Higher quality lithium-ion battery of 6400mAh that lasts up to 5+ hours on high, 10+ hours on medium and 26+ hours on the low setting which makes it one of the best batteries in the market. The light is 100% percent waterproof from a battery to light and can be submerged entirely in water for up to thirty minutes. The lights are developed using CREE T6 LED technology which increases its lighting duration. The lights are either mounted to the handlebar or be used with helmet accessories thus can be not only used in cycling but also in multiple activities which include hiking, camping and running. The light is great to be used in all circumstances thanks to its extended range Bright eyes provides clear visibility at 3000 feet and pure brightness up to 500 feet. The bright eyes are also equipped with free diffuser lenses, head harness and velcro ties, and a LED silicon tail light. The light is efficient and durable but also has its feuds for instance although the light is magnificent, the mounting system isn’t one of the best made. The attaching system is not secured and may sometimes fall off when riding on uneven surfaces. However, bright eyes are still among the best with so much to offer Its amazing strobe and SOS pattern makes it one of the best bike light. The light attaches in mere seconds and does not require any tool manufactured with Uncharted Roads Gear technology fits in a wide range of bikes from kids-bicycles to mountain bikes. 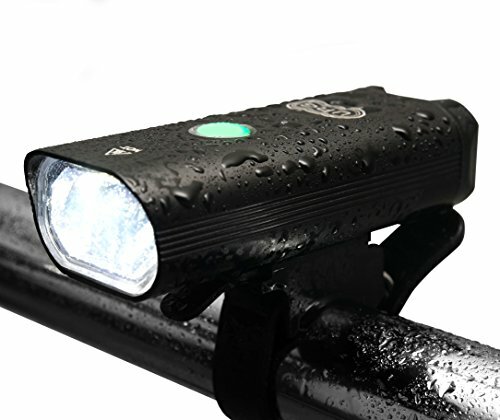 The light is ultra bright with high quality and waterproof materials thus efficient to be used in all weather conditions. However, it’s not advised to submerge in water intentionally is rainproof. The light settings include a flood, distance, red and SOS mode. The distance light is good at 40 meters, while the flood is capable up to 24 meters. The light comes with a USB rechargeable 3.7 V 2200 mAh lithium-ion battery. The light is mainly made up of light-weight aluminum material with hard anodized finishing. The only disadvantage of the product is the rubber band they provide to tie the bike. Let’s very thick and goes around the hooks on the side of the light to hold it in place. The band can tear apart when repeatedly used thus you have to buy a new one. 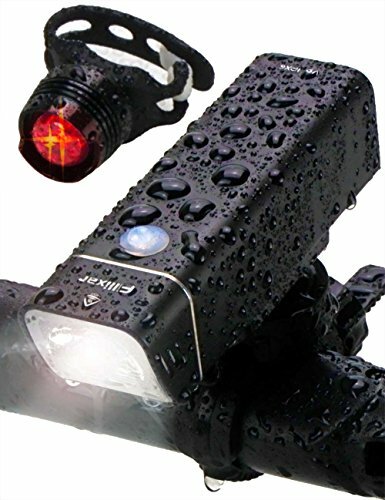 However, its advantages exceed its disadvantages since it’s a cheaper product compared to the other mountain bike lights. The materials used in making the product is militarily graded. There are many things to consider while choosing a right bike light depending on your budget and the one you would like to purchase for your bicycle. Durability is also a major thing to consider since you do not want to buy a product today and get diminished tomorrow. For bicycle holics riding without limitation such as darkness is one of the key achievements. Battery life is also vital as longer battery life is directly proportional lighting duration hence increasing its efficiency and reliability for the user. Cycling becomes much fun and enjoyable when you can see what you’re doing-especially at night. Without proper lighting riding at night can be unpleasing and may be dangerous as well as sketchy. The evenings are a time to reckon with and tend to be more uncomfortable when you do not have a light to shine upon your path. If you happen to be a fan of biking than you know the unbound joys of biking are exceeded when you do it till very late and arrive home when it is very late in the night. At such times, the lighting tends to be dimmer thus raising the need for lights to keep you on your favorite trails doing things like practicing and trying out new, better moves. Why not check out the best gloves for mountain biking to complement your latest accessory. Thankfully, there are some headlights which come with great features such as setting up and lasting you for a long time. As you go on your adventures or try out new routes in your vicinity, these lights are the ideal partner and will take you far beyond where the initial bounds of your biking spirit had reached. Biking becomes much more fun and rewarding when you can step out of the bounds and reach out to better cycling. These lights have all the features you will be looking for your mountain bike and an ideal choice for sports enthusiasts that are looking to go way past their limits. Having the perfect light on your bike is one huge step towards ensuring a smooth and peaceful ride especially if you are going to be riding at night. The above-reviewed products are the best mountain bike lights there are on the market. 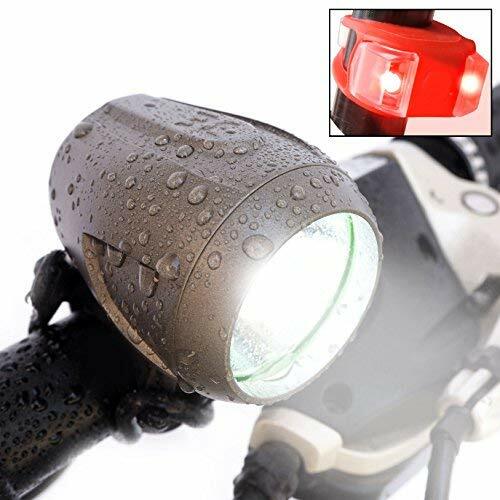 If you have been looking for the right light to purchase for your bike, these bike lights should do you a lot of good as well as do others who share the road with you.